Happy ho ho ho...and trust you are well. I would like to take this opportunity to thank all of you. Each one of us is dedicated to their vision and among us we all share a similar vision based on growth and empowerment for growers, landowners and friends in the Pacific. 2010 beckons with opportunity for all and promises to be a great year. 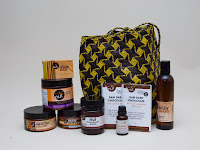 Our main focuses for 2010 will be to build equity within our African Pacific business operations, the Pacific Growers Export Partnership (PGEP) and the Nui Organic Brand. 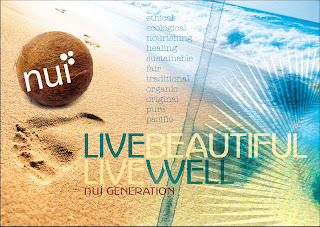 Through the NuiGeneration, a global community focused on social equity in the Pacific, we would like to consolidate core stakeholders of the Nui Organic Brand, whether they are growers, supply chain participants, processors and customers. It is our platform through which we wish to link the network partners in the South Pacific with our Nui customers and friends globally. We believe that an ethical business can, particularly through the internet, operate on a basis of mass collaboration in which the voice of its stakeholders is an active part of daily management strategy, transparency and communication. This is now possible throughout much of the Pacific and will set the platform for grower representation. I would like to take this occasion to invite you to join theNuiGeneration and be come a voice for the Pacific. 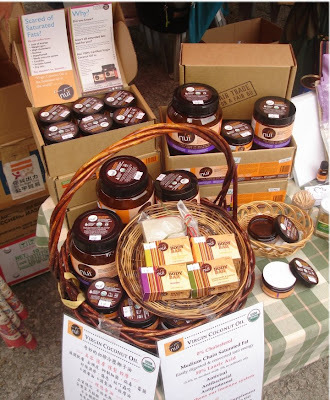 There is much to share from across the Pacific region as the NuiGeneration has strong roots in the Climate Change movement (click to bear witness for a minute), Organics, Fair Trade, cocoa, coconut, carbon, health and well being, all within the Pacific region. For those who have already joined thank you, please be so kind to check your details, as we try and consolidate our database to manage your input for the future. For those that have hung in to the end of this mail.. 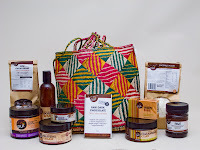 There is of course the special for the Vanuatu Christmas bag auction with a twist, price discounts every day until sold out of 20th December. Please have a look, freight is included to anywhere including to the Pacific. I thank you again for your indulgence, assistance, ideas, advice, contributions and most of all your passion in contributing positively and sustainably to a better world. Any questions on any matters please do not hesitate to contact me, please allow me to answer in 2010.
and a little for her too! If this sounds appealing, you are going to love the Nui Vanuatu Christmas bags. How does theGift Auction work? 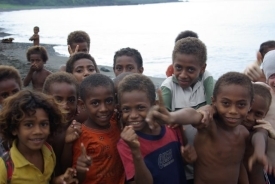 In North Ambae Vanuatu, there are four villages who struggle to meet their basic cash needs. The logistical difficulties of the many smaller islands of Vanuatu have made it difficult for the women to earn money through their traditional occupation of weaving bags. At times, the expense of getting their products to market exceeds the price of their bags which take days to make. 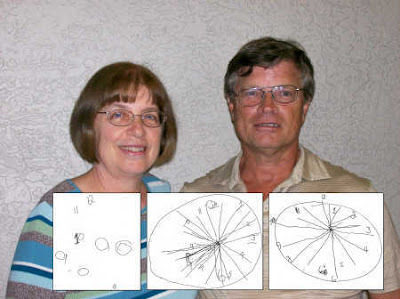 This is their main means of support as well as being an integral part of their lives. Given the cost of accessing markets many of the woman had stopped their weaving , but now, thanks to a concerted effort by ACTIV (Alternative Community Trade in Vanuatu, http://www.activ.com.vu/) of building a bridge to a world market with marketing and logistics, they are now re-discovering their traditional handicrafts. 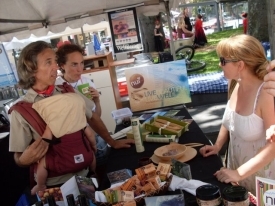 Opening the islands to a sustainable market that respects fair prices, the integrity of the culture and the environment is a core philosophy for founder Sandrine Wallez. The communities are benefiting as you have decided to directly support the communities in the Pacific through the purchase of Nui products and handicrafts. The communities in the Pacific are benefiting with your decision to directly support them through the purchase of Nui products and handicrafts. Yes, the power of change is in your pocket! and this Christmas is no different! but don't wait too long because there is limited stock. … until the closing date 4pm, 20th of December. Be sure to get one… there are only 20. SHARE YOUR FAVOURITE COCONUT FLOUR RECIPE OR INVENT A NEW ONE! At Nui we believe that food should not only be healthful and nourishing but look and taste sensational aswell. 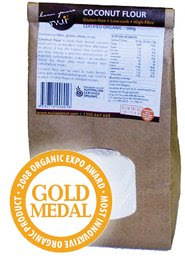 Nui’s coconut flour can add great nutritional benefits to your meals as well as delicious coconut flavour. You can substitute 15-25% of the flour in some recipes adding a little more liquid to compensate for coconut flour’s "thirstiness". So get creative and see how you can add the powerful health benfits of Nui coconut products to your daily meals. Coconut flour is made from ground coconut meat and is an excellent high-fibre, gluten free alternative to wheat. In fact it has the highest fibre content of any flour. The very low concentration of digestible carbohydrates in coconut flour makes it an excellent choice for those who must restrict their carbohydrate intake. Coconut flour can be used to make breads, cakes, pies, and other baked goods. Pre heat oven to 170°. Combine eggs, maple syrup, vanilla, oil and coconut milk together and blend. Add mashed banana and dates and blend lightly so as not to fully puree the dates and bananas. In a mixing bowl combine coconut flour, almond meal, spices and baking powder. Mix well. Add blended wet ingredients to the dry mix and stir thoroughly. Fold in the chopped walnuts. Spoon mixture into a loaf tin greased well with coconut oil. Bake in 160° - 170° oven for 60-90 mins until cooked through. Allow to cool for 20 mins before sliding a knife around edge of tin and turning out onto a wire rack to finish cooling. Allow to cool completely before storing in an airtight container. Wow - You might be thinking right now "hhm a lot of money has just been thrown on a very big bushfire in order to motivate us all to go out and spend!" Or your just thinking - "Yippee $900 bucks to spend!" Well spare a thought for our pacific neighbours who on top of struggling with Sea Level rises and severe depreciations in their currencies, have had their largest industry (Tourism) decimated by "the lack of confidence". And too right none of us want to take holidays right now because as the old adage goes. People who holiday in a recession end up with No Job! 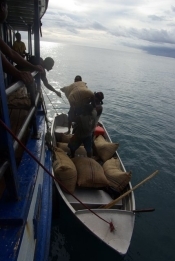 So again our South Pacific Communities find they are relying on subsistance and agriculture to sustain their families and their society and culture while ever the temptation is to uproot and head for the Big Smoke. You might not be planning a long holiday in the tropics this year but why not indulge yourself with some of our luxurious 100% virgin coconut oil and grab a friend to rub it in. At the very least you'll feel like you just stepped out of a tropical Island Spa and you'll be helping keep bread on the table of a family in the pacific. I start this post with a question! Can a Brand build a social asset, providing revenue, security, investment and interaction for it's stakeholders with the emphasis on social development, economic and environmental sustainability and Living Fairly? 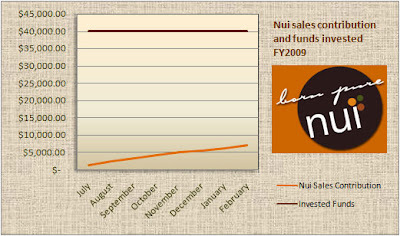 As we step into 2009 we have come the full circle of realisation that what we set out to do with nui was change the way conscious purchasing decisions are made by building an infrastructure to make the process of bringing lovingly produced products to customers all around the world. We are now 90% there. We built the back end, our 10000 communities in the pacific and we built a network owned and operated by them in the field. Now we need to move the next step to make real our dream of linking 10000 community producers with 1 million Nui generation customers. What we have now is a great range of product t o create revenue for our producers, investors and for you the customer. What we need to move forward is investment in build the front end infrastructure, the customer base and we need help to talk and network and promote our story. We built a beautiful bridge now we need to lay the road base so communities and customers can freely move across. If you believe that we should build a fairer system to trade, if you believe that we as western consumers owe an environmental debt to our neighbours in the pacific or if you would just like to be more informed about your purchasing choices then there are a number of things you can do. 1) We are building a systems of verification, a track and trace, if you like so that every product is coded and that code automatically brings up the contribution of purchasing that product has made to the social, environmental and economic improvement of the livelihoods of our community stakeholders. A)Through the foundations 2% transaction fee and B)through the direct contribution of raw materials into the finished product. Lets not beat around the bush - to do this we need Cash - either by way of donation or investment, Our company is open for all Australians to invest. From parcels of $1000, We are selling 33% of the company has been set aside for private investment to raise funds to build our brand equity. 33% of the company will be held in trust by the NUI Foundation and the generated funds will be independently managed to invest in real improvements in the livelihoods of our pacific neighbours. The other 1/3 is owned by our processing partner African pacific to help build it's capacity in providing organic certification and improve processing methods and the quality of our products. If your interested in a prospectus please email Andreas@africanpacific.com for more details. 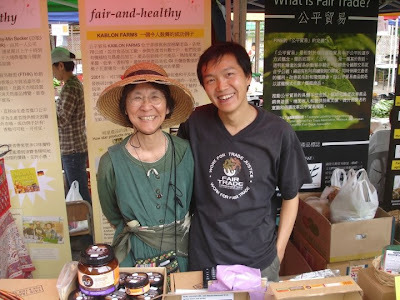 2) We need talented people - with passion about the pacific and fair trade and organic production, people in media, pr, marketing, food and health and especially, programming web design and database management. People prepared to give a little or a lot of their time to build this asset. This is not a job add it's a call for investment in time and talent to the Cause. 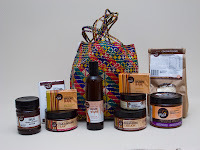 3) Transactions fuel the economic system and our current revenue stream is to sell 100% organic body, beauty and food products that give you the unique benefits of virgin coconut oil and Cacao. Please if you've got a few bucks to spend on a friend, our products make exceptional gifts, so visit http://www.nuigeneration.com/, join up and get great deals and discounts on our products and learn a little more about the issues facing our generation.